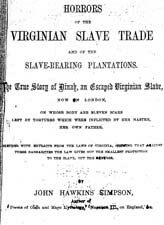 John Hawkins Simpson Horrors of the Virginian Slave Trade and of the Slave-Rearing Plantations. The True Story of Dinah, an Escaped Virginian Slave, Now in London, on Whose Body Are Eleven Scars Left by Tortures Which Were Inflicted by Her Master, Her Own Father. Together with Extracts from the Laws of Virginia, Showing That Against These Barbarities the Law Gives Not the Smallest Protection to the Slave, But the Reverse. Horrors of the Virginian Slave Trade and of the Slave-Rearing Plantations. The True Story of Dinah, an Escaped Virginian Slave, Now in London, on Whose Body Are Eleven Scars Left by Tortures Which Were Inflicted by Her Master, Her Own Father. Together with Extracts from the Laws of Virginia, Showing That Against These Barbarities the Law Gives Not the Smallest Protection to the Slave, But the Reverse. Fugitive slaves -- Virginia -- Biography. Slavery -- Law and legislation -- Virginia.